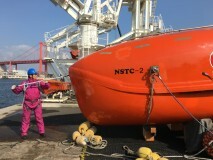 NSTC had periodic inspection for our lifeboats who have been played an important role in our training. The inspection has been conducted for one week to thoroughly confirm the performance of the lifeboats. 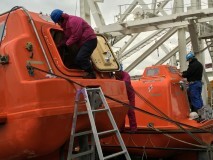 There are two types of lifeboats in NSTC, Davit System Lifeboat (NSTC-1) and Freefall System Lifeboat (NSTC-2) and both of them were landed to have a complete overhaul. Despite the rain and wind, we checked up the function and safety of them and replaced components if needed. Two lifeboats on land is unusual scene. Having shined up and repainted, they looks still shiny even they’re five years old. The affectionate eyes of painting staff was very impressive for me. We also had load test to ensure the safety load of the boat. Re-painting the hull with affection. the vessel, the lifeboats here in NSTC are launched for each training, hence, they might be the most active and busy lifeboats in Japan. All the inspection successfully finished and they have been set on the cradle and been tested launching to come back to the training from this week. Taking all possible measures to ensure safety is the key to support the safety of the training. I hope the lifeboats could enjoy one week holiday and regained energy for their hard work.